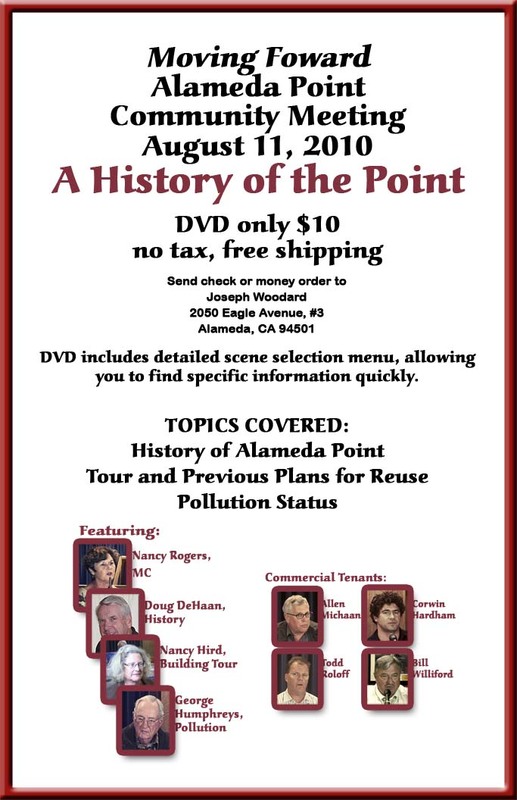 Held August 11, 2010 in the Alameda Naval Air Museum, this meeting considered the history Alameda Point, previous plans for its development including the community-based reuse plan, pollution status, and the experiences of four commercial tenants. The moderator was Nancy Rogers. Speakers included Doug DeHaan, Vice Mayor; Nancy Hird of the Alameda Architectural Preservation Society; George Humphreys from the Restoration Advisory Board; Allen Mischaan, CEO of Mischaan's Auctions; Todd Roloff, VPO of NRC Environmental Services; Corwin Hardham, CEO of Makani Power, Inc.; and Bill Williford, CEO of Rock Wall Wine Company.